AFHS students visit the NC State Entrepreneurship Garage. Jackson, a teacher at Apex Friendship High School (AFHS), has teamed up with NC State programs to design an experiential entrepreneurship program for high school students called the Applied Synergies Partnership (ASaP). ASaP “energizes, equips and empowers young people to pursue their passions” through aligning the North Carolina Department of Public Instruction’s Entrepreneurship I Honors curriculum with the learn by doing structure developed through the Poole College of Management Jenkins MBA Technology, Entrepreneurship and Commercialization (TEC) program. The TEC program, run by Lisa Chang and Steve Barr, gives students the opportunity to engage in all stages of company formation and growth. To date, startups launched from the program have raised more than $400 million in funding for partners and produced more than 350 new jobs. Jackson says the collaboration has benefitted both programs. TEC provided ASaP with an experience framework, worksheets and the idea for innovation coaches and, in turn, has benefitted from ASaP strategies including more frequent delivery of presentations and a refined peer evaluation. Dan Jackson (far left), Lisa Chang and Steve Barr (center), and AFHS at a TEC class. 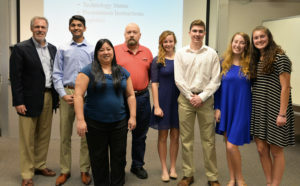 Two teams from Apex Friendship High School recently attended a TEC class to practice pitching their business concepts and to receive feedback from the MBA students. Both AFHS teams were preparing for the annual 2018 DECA International Career Development Conference in Atlanta, GA.
Teammates Jatin Srivastava, Davis Bridenbaugh and Grace Fleming pitched their after-school tutoring program called Peak Prep. The program focuses on preparing high school students with important life skills including public speaking, interviewing and personal branding. The team’s motto, “Preparing students for the future that matters,” is what Jackson is doing for his students in the classroom. Another AFHS team, made up of juniors Naomi Nice and Lexie Canton, pitched their product SAVE (Sustainable, Affordable, Vital and Ecological). Their venture utilizes capsaicin as a natural pesticide to provide South African farmers with a safer and more affordable pest control option. They estimate their product could save farmers up to 30 percent every month. It is knowing that the largest room in your house will always be the room for improvement. One of Jackson’s main learning goals for his students is helping them develop an entrepreneurial mindset that can be applied to any career path they choose. Their experience in the classroom is designed to instill the fundamentals of strategic thinking, growth mindset and reflective learning. 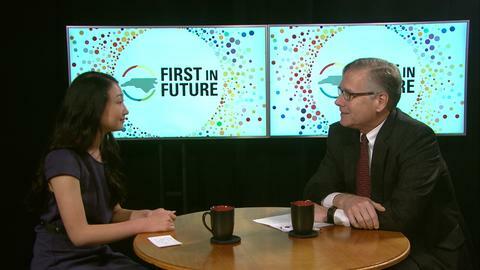 One of Jackson’s students, Jessica Hong, was recently featured on UNC-TV’s First in Future segment. She discussed how Jackson’s teaching style contributed to her entrepreneurial spirit. Jackson has also worked closely with Raj Narayan, associate director of the Kenan Institute for Engineering, Technology and Science, to launch the program. Narayan serves as an executive in the TEC program and as an Innovation Coach in ASaP. Jackson reported that on his end of the course assessment, 100 percent of students completed the Honors portfolio project which required thorough business research, analysis, decision making, planning and execution; and 100 percent passed the final exam meant to “test the mastery of entrepreneurial concepts.” Sixteen of his student teams were taken to the annual DECA NC State conference, where twenty-five students were selected to advance to the International Conference in Atlanta. Nine of Jackson’s students made it to the top 20, with two students ranked as number six in the world. He credits the hands-on teaching model as foundational to his students’ success. Cardarelli working with AFHS students in the eGarage. 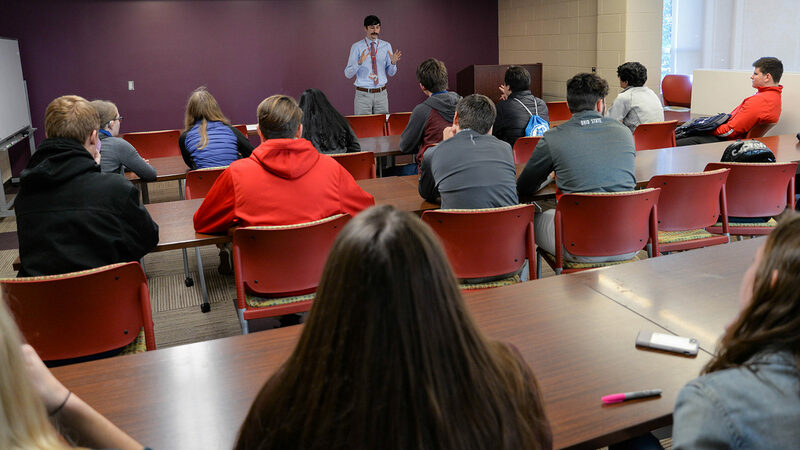 Both Jackson and Narayan collaborated with the larger NC State Entrepreneurship community to expose AFHS students to the entrepreneurship resources offered at NC State, including David Cardarelli, the manager of the NC State Entrepreneurship Garage (eGarage). Cardarelli is a student in the Jenkins MBA program and recently completed the TEC program, where Jackson and Narayan served as his team’s executives. 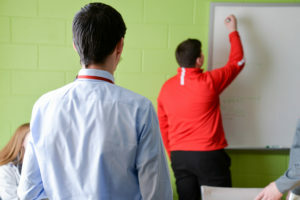 Through his work with the eGarage and with his classwork, Cardarelli has seen first-hand the value of introducing students to entrepreneurship education while still in high school. In addition to support from the Kenan Institute and the eGarage, Apex Friendship has received support from the on-campus and local entrepreneurship community, including NCSU Libraries, the NC State Entrepreneurship Clinic, the NC State Social Entrepreneurship and Innovation program, the Biomanufacturing Training and Education Center (BTEC) and HQ Raleigh. To learn more about becoming involved with Apex Friendship High School’s experiential entrepreneurship education, contact Dan Jackson at djackson2@wcpss.net or visit the ASaP website.